In this week’s tip, we will be taking a closer look at the Solid Edge Feature Library. Not only can the feature library be used to pull in completed parts but also previously created features in Solid Edge. This is especially useful to help reduce design time when frequently using the same features. **Note: You can only place a synchronous feature library member while in the synchronous environment. You can add to the feature library from the Ordered environment. The only ordered element you can add is a feature. When placing an ordered feature in the feature library, the attributes for the feature are maintained. A feature library entry cannot contain a mixture of synchronous and ordered elements. **Note: You can only place an ordered feature library member while in the ordered environment. 4. 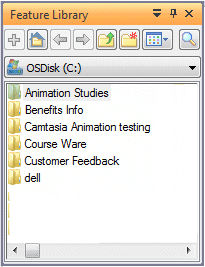 Upon pasting you will notice that the Feature Set Information dialog box is displayed. You can use the Feature Set Information dialog box to review the feature elements which were captured, review their status, and define custom prompts and notes for when you later place the library member. 5. 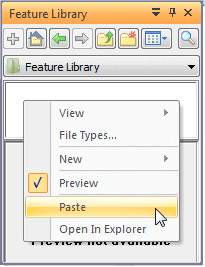 To pull the created feature into a new part, open the Feature library and drag the feature you created previously into the graphic window. 6. 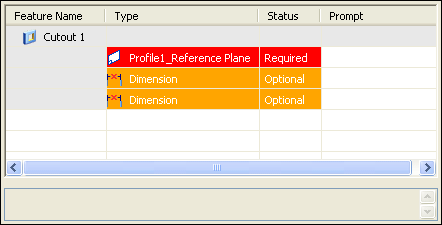 Notice after dragging in the feature that the first row in the Feature Set Information dialog box is active, which requires that you define a profile plane. 8. Once these have been defined you will notice the feature you saved to the Feature library is now present on your model. This has saved a lot of design time by not needing to recreate the cutout you used on another model. 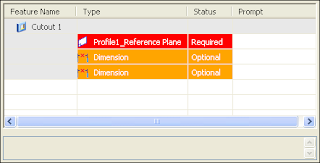 Synchronous Modeling does not require the use of the Feature Set Information Dialog box. 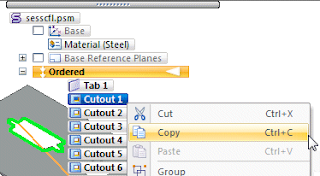 Saving your feature follows the same steps as Ordered Modeling but placing it is slightly different. In Synchronous, you drag in the feature then locate it using the Steering Wheel. The feature is not placed until you have clicked in the appropriate location.